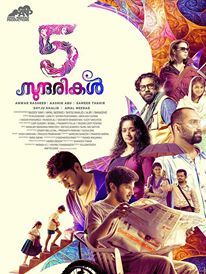 5 Sundarikal is an anthology of five short stories. Each story depicts different facets of woman... Daughter... Friend... Wife... Lover... Mother... The story portrays women’s matchless beauty which lies in her silence while she says the unsaid and while she speaks the unspoken. And the end the result is that the movie awes the audience!!! Directed by debutant director Shyju, this is a story of a school-going girl (Baby Anika) has a hobby of collecting photos of married couples. On seeing her passion, her friend (Master Chethan) gives the idea of clicking their photo. They go to a studio and click a all-smiles photos. What follows next forms the rest of the story. Nivin Pauly as the robber clad in the attire of Santa house arrests Isha Shervani on a New Year’s Eve. An amazing twist awestruck us and how she hoodwinks him forms the rest of the story. Sameer Thahir, the director, has done a commendable job. There are several loopholes. Yet, the feel of the movie intoxicating, thereby hallucinating the ratiuonal thinker. Gowri Lakshmi (Kavya Madhavan) and Jonathan Antony (Biju Menon) is a happily married couple. Their life is full of smiles and love. But, a set of events that unravels on their wedding anniversary changes their lives forever. A fatal accident makes Dulquar Salman bed-ridden. He kills time by reading books and observing his neighbors. He listens to what others say and see as much as he can. A newlywed couple who come to his neighborhood grabs his attention. The reason being, the wife is taller than the man. Dulquar observes them and sees them evolve from a newly-wed to an expecting parents. He also becomes a silent spectator to a tragedy that turns the couple’s lives upside down. Fahad Fazil, a business man, drives his way from Malappuram to Kochi. A series of events that unfolds during that journey coupled with regular phone calls from his wife, Ami (Asmitha Sood) who keeps throwing riddles at him makes the story an interesting watch. Thus 5 sundarikal is all about celebrating womanhood... It celebrates her different shades... All women in this film are beautiful; the beauty of their heart makes them endearing. I would say that the movie will take you through an emotional roller-coaster. And I bet that you will not regret the journey. Excluding the first movie, sethu lakshmi, the film is just waiste of time..
Thats a pretty good work from Shyju..